Bert’s house. The Skinner home. 26 Main Street. Evarts Estate. These are just some of the names that represent the place we now call the Snapdragon Inn. Over the past 190-plus years, this building has held a special place in the heart of those connected to it; we hope you’ll feel the same way. The Snapdragon Inn was first known as The Skinner house, built by John P. Skinner circa 1815. Skinner, born in Connecticut in 1788, was the owner of a busy stage line along the Connecticut River from Haverhill, N.H., to Hartford, CT that was headquartered in Windsor. William Maxwell Evarts purchased the John P. Skinner home (as it was then known) for $5,000 in the 1820s. It became part of a three-home residential compound of the Evarts family that grew over the years to include a number of homes and over a thousand acres–sometimes referred to as Evarts Estate. It also began almost two hundred years of ownership of the property by the Evarts family line. Evarts and his family (he and wife Helen Minerva Bingham Wardner had 11 children) split their time between the high society circles of New York City and Windsor, Vermont. Evarts was the first (and longest serving) president of the Association of the Bar of the City of New York, chief counsel for President Andrew Johnson during Johnson’s impeachment trial, and from July 1868 until March 1869 he was the 27th Attorney General of the United States. During President Rutherford B. Hayes’s administration (1877-81) he served as the 29th Secretary of State; and from 1885 to 1891 he was U.S. Senator from New York. Evarts was a well known and accomplished orator; some of his best speeches have been published, including volumes available in our Inn library. Evarts died in 1901; his funeral was covered in the New York Times and included pallbearer J.P. Morgan. In his honor, the Supreme Court listened to memorial speeches instead of normal arguments and then the justices made memorial statements before taking a special adjournment. Evarts is buried in Windsor. Upon Evarts death, the home 26 Main Street passed to his 8th child, daughter Elizabeth Hoar Evarts Perkins. Elizabeth was born in New York City in 1858 and married Edward Clifford Perkins in Windsor, Vermont in 1882. Elizabeth and Edward had six children, three of whom (William Maxwell Evarts Perkins, Charles Callahan Perkins, and Molly Thomas) collectively became the fourth owners of the home when their mother died in 1940. William Maxwell Evarts Perkins, better known as Max Perkins, was a well-known editor at Scribner’s. Perkins famously guided the literary careers of Ernest Hemingway, F. Scott Fitzgerald, Thomas Wolfe, and Marjorie Kinnan Rawlings among many others. Perkins was known for his skill in nurturing young writers, bringing out their talent and helping it to blossom. 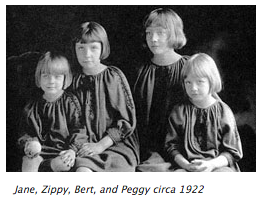 He did the same for his daughters – he and wife Louise Sanders had five (Bert, Zippy, Peggy, Jane, and Nancy). He was an exceptionally loving and encouraging father; letters exchanged between him and his daughters, written during the long summers when the girls and Louise were in Windsor and Max was at work in the city, were saved by Louise and have been collected in a volume, available in our Inn library. After Max and Molly passed, Charles became sole owner of the home. When he passed, it was left to his four children, none of whom were interested or able to take possession of the home. Wanting it to stay in the family, they offered it to their cousins. Bert and Zippy (two of Max’s daughters) were delighted and became owners of 26 Main. They shared the home for many years, and eventually Bert made the home her own. Bertha Perkins Frothingham was a well-known and well-loved member of the Windsor community, noted for her support of the local library and other literary institutions. Shortly before her death (in 2005) she sold the home to the Seale family. Perry and Jill Seale and their five children lived in the home for 2 years before selling it to us in 2007, when it began the journey to become the Snapdragon Inn. Biography of John P. Skinner, see Genealogy – Skinner, Edward Payson, Jr.